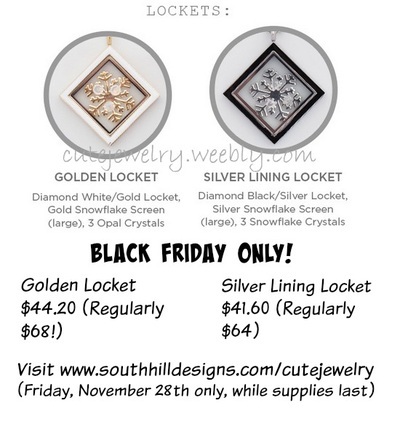 2014 Black Friday Specials and Black Friday Deals from South Hill Designs Cute Jewelry! Save on bundle packs of charms and screens for glass floating lockets! Also save on pre-designed floating lockets with floating charms and screens. South Hill Designs Cute Jewelry will also have a great deal on wrap bracelets! 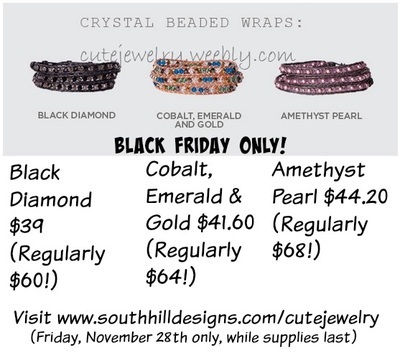 South Hill Designs Cute Jewelry Crystal Beaded Wraps: Black Diamond Crystal Beaded Wrap Bracelet will be just $39! Regularly $60! The Cobalt, Emerald & Gold Crystal Beaded Wrap Bracelet will be just $41.60! Regularly $64! And the Amethyst Pearl Wrap Bracelet will be just $44.20! Regularly $68! South Hill Designs Cute Jewelry Christmas Charmed Floating Glass Locket Charms Package is only $14.85. That is a HUGE saving! Regularly $33, this charm package includes an Angel Charm, Christmas Stocking Charm, Cross Charm, Red Crystal Charm, Green Crystal Charm, and EXCLUSIVE Medium Gold Snowflake Screen! South Hill Designs Chanukah Charmed Floating Glass Locket Charms Package is also just $14.85! 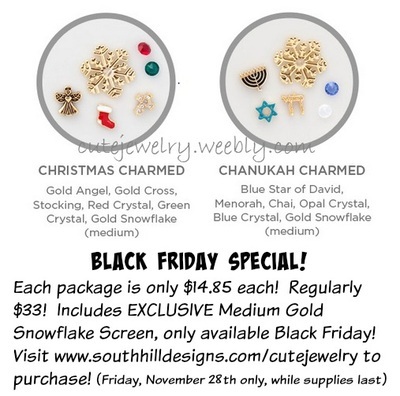 This huge savings is regularly $33 and includes a Blue Crystal Charm, Opal Crystal Charm, Chai Charm, and NEW Blue Star of David Charm, and NEW Menorah Charm, as well as the EXCLUSIVE Medium Gold Snowflake Accent Screen! Golden Locket Package is our Gold Diamond Locket, with a Large Gold Snowflake Screen, and 3 Opal Crystal Charms. Regularly $68, this will only be $44.20 on Black Friday (November 28th, 2014). The Silver Lining Locket from South Hill Designs Cute Jewelry is our Black and Silver Diamond Locket, with Large Silver Snowflake Screen, and 3 Crystal Snowflake Charms. Regularly $64, this will only $41.60 on Black Friday 2014! All of these deals go LIVE at Midnight, Mountain Time, and will only be while supplies last! So set your alarm, and shop in your jammies at www.southhilldesigns.com/cutejewelry! Black Friday will be easy and simple with South Hill Designs Cute Jewelry!